I re-found my love of swimming and open water when I did my first triathlon some 12 years ago. 6 Ironman distance events later, looking to improve my own technique and help others, I qualified as a swim coach and teacher. My first language is Welsh. I love cooking and have a passion for locally sourced ingredients. In the winter months i work as a ski chalet manager for Reach4theAlps based in both Morzine and Les Gets. I started swimming in the sea with the Jersey Long Distance Swimming Club (JLDSC) at 8 years old, gradually spending more and more time in the sea around the stunning beaches of Jersey. My first taste of open water swimming came at 12 swimming around Jersey in a relay, then moving onto a solo swim 3 years later. In between I also swam Lake Coniston and the English Channel in another relay. The next couple of years was spent crewing for a number of English Channel swims, including a successful double Channel, round Jersey and Jersey to France swims, spending a lot of time in a kayak. Then in 2015 I also swam from Jersey to France, with what appeared to be half the worlds population of jellyfish standing between me and the French beach. My most memorable moment has to be during a particularly tough hour of my Jersey to France swim one of my crew fell spectacularly into the water while handing me a new set of goggles. My top tip, having taught children to swim, take it back to basics, if you’re not blowing bubbles you’re not breathing right. I have a Fine Art Degree and love to knit and crochet. My deep connection with the ocean began as a young kid growing up on the beaches of Durban, South Africa. Endless summers spent surfing or being hurled about in the shore break has left an indelible mark on me and as a result I have spent most of my life either in the sea or on it. I work as a RNLI beach lifeguard as well as operating a water sports adventure company, based in Cornwall. Cornwall, Outer Hebrides and Greece Cyclades. There’s a lighthouse in Cornwall which has a cave that runs through it. Only accessible at spring low tides, it’s home to packs of seals, almost pitch black with a very small underwater hole as an exit. To return to the shore you have to beat the racing tide or be swept down the coast…epic!!! If I could surf everyday, I would. Winner of the Cub's one width in 1967!!! 1968 joined Woolwich Swimming Club and went on to swim butterfly at national and international level. A career made me take a back step from swimming, encouraging me to play water polo reaching county and national levels. 2008, I was invited to the 2k sea swim at Eastbourne. After finishing I decided to attempt to swim the English Channel the following year. My 6 hour qualifier, much to my astonishment, was achieved on my first visit to Dover Harbour. I was now hooked on open water swimming. I have guided on LDT only since 2013. Representing Great Britain at the World Life Saving Championships. Swimming the English Channel in 2009 and walking up the sandy beach of Cap.Gris.Nez In 12 hours 55 minutes. Always train hard and push yourself to your limit. Always complete a training session. Find different stroke techniques for long distance swimming. Keep your goggles away from Vaseline hands! Interesting Swim Facts About You. 37 years as a London Police Officer, serving as a protection officer to high profile dignitaries. Police dog handler. Specialist explosive search officer. Advanced motor cyclist. I am a PE teacher and I was teaching at the University in Chieti up until 2014. I am currently a swim coach and lifeguard and I work for SS.Lazio Nuoto in Rome. 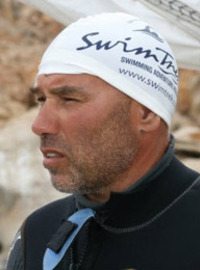 I am the President and founder of ASD Swimtrekking, this year completing 20 years of activity. I have been a swimmer since I was 4 years old but I never loved to swim in pools and fresh water and I retired from the pool at 14 years old. My passion was to swim in the sea, looking to explore, and when I was an early teenager I loved to swim with my friends in the blue sea of the Eolian Islands with a mask and snorkel. At 15 I completed my first circumnavigation of Panarea and from that moment every summer was the opportunity to explore to sea beauty swimming round the islands. My first big challenge was in 1993 when I completed a 150 km coastal of all the Emerald Coast in Sardinia in 13 days. From summer 1994 to summer 2005 I completed the swim of all the Italian minor islands (all the Italian islands apart from Sicily and Sardinia) for a total of 44 islands as a solo swimmer with no boat support. In the winter of 2005 I swam around 10 island in the huge archipelago of Los Roques in Venezuela and in 2006 I swam around the island of Ithaca in Greece. 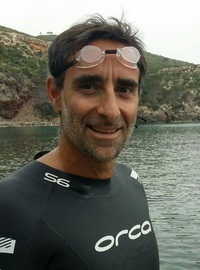 I have also completed the swim of the San Bernardo archipelago in Colombia in winter 2014 and the coastal swims in the Galapagos archipelago in winter 2015. 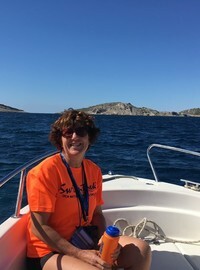 I have been guiding for Swimtrek in Sardinia since the start of that trip and as well the Aegadian islands and the Aeolian islands. This year I will also be guiding the Tremiti islands. The most memorable moment was when I was swimming around Stromboli island in 1996 and there was a lava eruption combined with a thunderstorm. It was an incredible to swim in such conditions and an unforgettable scenery to experience. Swim with a kickboard in one hand. Pull and when you enter, aim the hand for the corner of the board and reach out under the side of the board instead of for the center. This can correct some of the common mistakes of moving the hands across the body on the reach after entry. I love the sea, and swimming is an opportunity to explore marine life in a very unique way and to feel part of it. Back in the day, I swam competitively for the Sussex and Internationally for England. It’s safe to say swimming has been in my blood since I was a youngster and still find it hard not to dabble with the occasional race here and there! Nothing beats the rush of competition and fast swimming! Nowadays I tend to be seen more on deck than in the water, coaching the up and coming age group swimmers and master swimmers for Brighton Swimming Club. 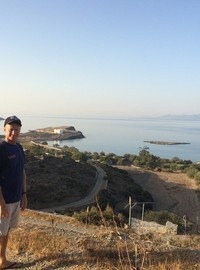 Bosphorus Continental - Istanbul, Durdle Door - Jurassic Coast, Latitude Festival, Lycian way - Turkey & St Kitts & Nevis. Swimming the English Channel with the SwimTrek office was one of the most memorable moments to date for me as this was a childhood dream. However, I will never forget the time whilst representing Great Britain in South Africa where not only did I win a bronze medal, but I had the opportunity to swim against competitors and dolphins alike. Consistency provides opportunity, opportunity provides a swimmer with the chance to achieve anything. Humans are creatures of habit so what we do repeatedly and what becomes a habit, is what we do instinctively in times of fatigue and pressure. I struggle with the concept of shoes...Flip flops for me all year round! At five years old I joined my first swim club in Satellite Beach Florida, the Cape Coast Swim Team. If I wasn't in the ocean, I was in the pool. For the next fifteen years, I was a member of eight different swim teams crossing the United States from Florida to California back to the steps of the Pentagon in Washington, DC. Swimming highlights include at the age of 12 I broke the minute mark in the 100m freestyle, and stormed on from there to qualify for the US Olympic Trials in the 50 and 100m freestyle. I never made it to Seoul or Barcelona but I have swum with many exceptional people who did. My professional, competitive swimming career ended when I graduated from High School and decided to focus on education. In the past five years I started competitively swimming again, training around the world with teams such as 'the Bold and the Beautiful' in Australia and competing in races such as the Eton Swim at Dorney Lake, the Great London Swim in the Royal Victoria Docks, and the local Swim Around the Pier in Brighton. I recently spent 6 months travelling in South America and have been through, over and under waterfalls as well in glaciers. I am currently living in Paris researching the amazing pools and waters here. Keeping swimming pace at the side of a whale shark for 15-20 minutes (or a good mile) off the coast of the Isla del Espiritu Santo in Baja, California. Always pace oneself for the distance (and make sure that you can see it with excellent goggles). The challenge of a natural sprinter like me is that we like to be bold and go for it at the beginning. Keep the adrenaline and excitement in check. It makes for a better swim result and overall experience. I am a fully trained and qualified Body Therapist specialising in Relaxation Massage. Born in Rome, I started swimming since my early years at Circolo Canottieri Aniene (most awarded swimming team in Italy with many Olympians) where I was a swimming instructor during my university studies. I’ve been swimming competitively as breaststroker for a long time both as teen and master. I did my first Open Water competition about ten years ago and I loved it! I moved to Australia where I swam in Port Phillip Bay with lots of animals but thankfully I’ve never met a Great White! Currently living in Ibiza which is a dream location for the open water swimmers. I took part of a memorable Swimtrek in the Greek Cyclades few years ago and since then I’ve been dreaming to be a Swimtrek guide. Since I moved to Ibiza, I’ve been guiding groups around the amazing coastline of the white island. During the summer 2008 I swam the Sicily Strait, pretty much a MUST for an Italian swimmer, and I will never forget the incredible color of the deep blue water. And the old ladies clapping their hands from the balcony of the houses built right on the beach where we arrived. Swimming for me is all about relaxation and gliding. Enjoy every single stroke, get lost in the blue. If your muscles are relaxed and your consciousness gets into a meditative state, your swim will be incredibly enjoyable and efficient. I’ve been working for major sport events for almost 20 years. In Rio 2016, I was the Mixed zone Manager at the Olympic Aquatic Center for Swimming and Waterpolo competitions. I was lucky enough to witness live the last sensational strokes of Michael Phelps. Six years ago, barely able to swim front crawl, I took a course to train for sea swimming with an end goal of a 1km shoreline swim and so the addiction to swimming began. Since then I've enjoyed the beauty of swims in the Lake District, Snowdonia, Angelsey and the Brecon Beacons. I have undertaken distance challenges include the Dart 10 km, Jubilee River 10 km and Henley Bridge-to-Bridge marathon of 14 km. Daily I brave the U.K. waters in Brighton as a year round 'skins' ( non- wetsuited) swimmer and tried out even more extreme temperatures (1.5 C) at the Cold Water Swimming Championships at Tooting Bec Lido this year. However, I'm never happier than in warm water and have loved my time as a Swimtrek customer. During trips to Turkey - Lycian Way, Greek Sporades and the Croatian Kornati islands, I've met fantastic people and my swimming family ever grows. I can't pick one as there's been too many beautiful sunrises, sunsets, full moon dips, murmuration swims, Welsh waterfalls and Amsterdam canal circuits shared with wonderful swim friends to narrow it down. Keep exploring new swimming experiences and challenges, you never know where it'll take you. There's a whole lot of fun to be had out there and great people to meet. My other water related skills include attending water births, as I'm a midwife. 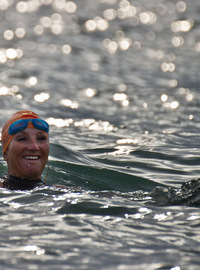 Swam the English Channel in August 2009, the oldest woman to do so at that time. Have been a primary school teacher for 18 years. Was awarded channel swimming coach of the year 2016 and has coached and supported 2 world record swims. Holds the record for having the highest success rate for coaching solo swimmers across the English Channel. Gozo, Mallorca, Sicily, Turkey, Hellespont, Brighton Swim-days. Feeling my feet touch the French beach after a 19 hour and 22 minute solo swim of the English Channel. Keep a wide arm, spear a wave, don’t slap it! No more than a 2 to 4 beat leg-kick. Never exhale all the oxygen from your lung. In 1983, myself along with my husband introduced the concept of the Mongolian Barbecue to Great Britain and ran a successful chain of restaurants for over 30 years.